Customer Service is Accent Screen Door and windows goal! 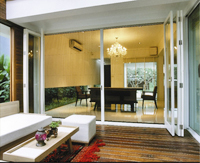 Accent Screen Door and Window is your premier Door, Window and Mobile screen dealer in Orange and L.A. Counties. We take pride in doing quality work. Serving Orange County Homeowners, Architects, and Contractors for over 12 years! Owner Jon Wilber has over 20 years of experience in the Construction Industry, and is a benefit in offering the right solution for each customer situation. Accent Screen Door and Window has been the Orange County Phantom screen dealer for twelve years, and has installed over 1000 of Phantom Screens. While still maintaining a perfect rating with the BBB, Accent Screen's main goal is to offer the best Customer service possible, while offering quality products and installation. All work is performed clean, on time, and professional by owner Jon Wilber. Offering a full mobile service, same day installations, and FREE in home estimates! Call today, and can offer a quote over the phone! -Custom made window screens THAT FIT! No Plastic.